Developmental psychologists and neuroscientists have long known about the negative effects of long-term removal of an infant from its mother. One UNM researcher wondered whether long-lasting positive effects can be created by introducing a newborn—in this case, a newborn rat—to a novel situation for a short amount of time. Cognitive neuroscientist Akaysha Tang, PhD, who holds professorships in UNM’s departments of psychology and neurosciences, has been studying social, cognitive, and neural development in rats with surprising results. She began her developmental study in 1997 by creating a new method of early life stimulation, called neonatal novelty exposure. Dr. Tang divided rat pups from the same litter into two groups with half as a control and the other half as the experimental group, both of which received matching amount of experimenter handling and away time from their mothers but with the experimental pups experience a daily three minute exposure to a relatively novel non-home cage during only the first 3 weeks of life. Using this within-litter design, she could draw more definitive conclusions about the relative contribution of environmental and genetic influences because there are no systematic genetic differences between experimental and control pups. A within-litter design also reveals how differences between siblings come about. A long-established method of neonatal handling, which involves having entire litters as experimental and other litters as control, can only tell how pups from different families grow to be different. With her new method in place, Dr. Tang designed an experiment to find out if a brief stimulatory experience in early infancy made a difference in rats’ neurological development into adulthood. Using 16 litters of rats, she took the mother out of the cages, then moved half the pups to an unfamiliar cage for three minutes a day for the first three weeks of their life. The remaining pups received the same amount of human contact, but remained in their home cage during the experiment. Researchers then returned all the pups to their home cage and reintroduced the mother, observing the mother’s behavior toward the pups. When the pups reached adulthood, they were tested for their spatial working memory, social competitiveness, social recognition memory, and stress response to familiar and unfamiliar events. In each case, the rats that were exposed to the mild stress of the novel environment for brief periods in infancy performed better in both of the memory tests and in the social competition, and showed greater selective increase in stress hormone when facing surprises. Although an increase in stress hormone is generally viewed as having a negative influence on cognitive function, several recent studies demonstrate that efficient stress hormone activation can facilitate learning under conditions of arousal. 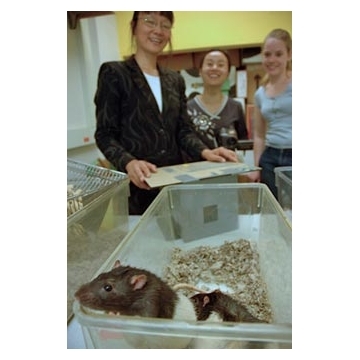 Dr. Tang’s results indicate that a selective increase in the ability of rats to mount an additional corticosterone response to an unexpected event but not to an expected stressor is associated with better cognitive and social functions. By maintaining sensitivity to unexpected events against a background of expected stress, the novelty-experienced rats were able to learn faster and remember better what they have learned in unfamiliar and surprising situations. One challenge that Dr. Tang faced in designing these experiments is that it is very difficult to determine whether maternal care may have influenced the long-term effects on adult function, as suggested by Michael Meaney, PhD, and colleagues at the Douglas Research Centre in Montreal. Even in a split-litter experiment, the pups that had the novel experience may behave differently, causing their mother to treat them differently from the home-staying pups. The difficulty lies in the fact that both the experimental and control pups within a litter were all intermingled together making separate observations impractical. 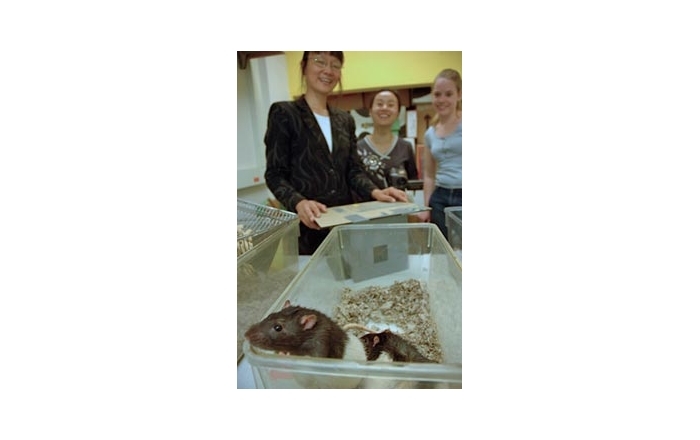 To check out how the mother rats might have contributed to the differences in her pups, Dr. Tang and her team returned the experimental and control pups to separate locations within the home cage and then observed, after the mother and her pups reunited post-novelty exposure, how the mother retrieved them, moving the pups from their separate locations to a single nesting pile. Consistent among all the litters tested, the mothers selected the home-staying pups before the novel-experienced pups. This meant that the novel pups received lower priority in maternal care than their home-staying siblings. Bethany Reeb, who recently received her PhD from Dr. Tang’s lab, did an experiment revealing that higher retrieval priority was associated with more effective nursing and licking of the pups. This means that novelty-experienced pups were unlikely to have received more maternal care than their home-staying siblings. This finding was the opposite of what would be predicted based on Dr. Meaney and colleagues’ findings. According to this prediction, neonatal novelty effects would be mediated by greater maternal care toward the novel pups. Dr. Tang’s finding show that despite the less maternal care received, novelty-experienced pups can develop into adults with better cognitive and social functions and more adaptive stress response. This means that very small but systematic changes in the early environment can create long-lasting adult differences despite a relative deficiency in maternal care.